Oh no, i can't find my aluminium push pins for my project board. What am i going to do ? No need to worry guys. Now you can buys 20 pins to add to your ever expanding collection of push pins. A great addition for any stained glass kit. 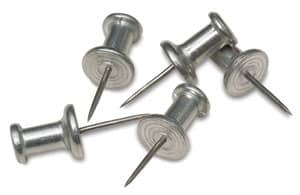 These pins are invaluable when it comes to assembling glass panels.